When it comes to profiting from precious metals, active trading opens doors that simple investment never could. 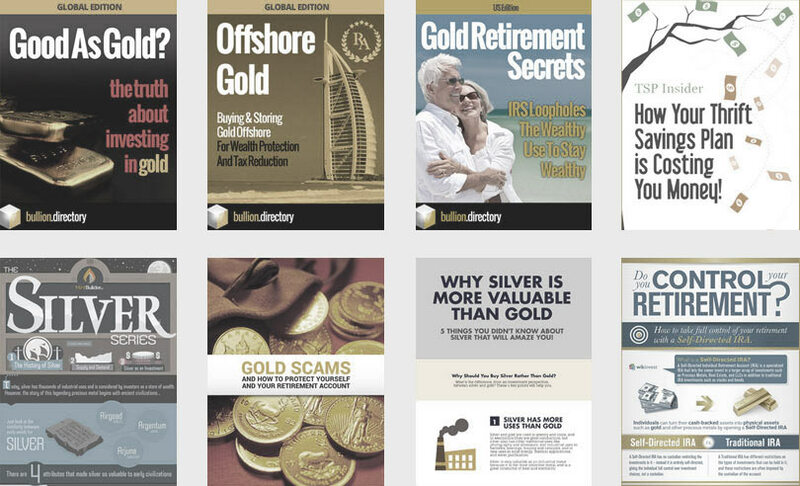 Alison Macdonald examines the money-saving and money making opportunities available when using physical bullion trading accounts to buy and sell gold and silver. Not long ago, most bullion buyers tended to be investors buying bars and coins for the long term, buying as a market hedge, as a secure store of value and as a portfolio diversifier. Investing in gold bullion meant buying and holding for the long term. Gold and silver traders on the other hand would buy and sell positions in precious metals derivatives such as gold ETFs or gold CFDs through a desktop or online trading platform . Trading gold derivatives is about speculation on market movement and realizing short-term capital profit. In the old pre-revolution trading landscape it was only the institutional investor-traders who were able to buy and trade physical bullion. This was because in order to trade physical bullion and take advantage of any short-term price movements it’s essential that the trader buys very close to the metal’s spot price. And the only way to buy close enough to market price and make this short-term trading possible meant the purchase of huge 300oz+ Good Delivery bullion bars. With a 6-figure buy price this meant trading physical bullion was limited to all but those with the very deepest of pockets. Buying smaller more “affordable” bullion bars or coins involved (and still involves) too big a spread to make trading feasible. Buying smaller bars and coins through a dealer inevitably means there’s going to be a sizeable spread – the spread being the difference between buy price and buy-back price if the price of gold remains static. Spread can be as much as 15% and more. With a spread of 15%, the small-scale trader would need to see a 15% increase in the price of gold just to break even. While precious metals DO rise by these kinds of amounts and sometimes in a matter of days – these events are few and far between, making trading in small and fractional dealer-sourced bullion a non-starter from go. It’s not that dealers are scamming buyers – quite the opposite – reputable dealers make only a minimal markup on bullion. It’s just that even with the very small profit the dealer takes, overall premium can still stand at several percent over spot, due to mining, refining, packaging, certification, shipping, wholesale profit and other costs that have arisen long before the bullion even arrives at the dealer. And buying at a huge premium over base price is NEVER a good way to start a trade. So What Has Changed? How Do I Buy Gold Cheap Enough To Trade? High retail / dealer spreads certainly haven’t gone away – and still make smaller-scale bullion “trading” a non-starter – as does the 6-figure purchase price required to buy good delivery bars. But thanks to advances in technology and digital security it IS now possible for regular people to trade physical gold bullion. These technological developments have seen the widespread use of an entirely new method of trading physical bullion – the Physical Bullion Trading Account. 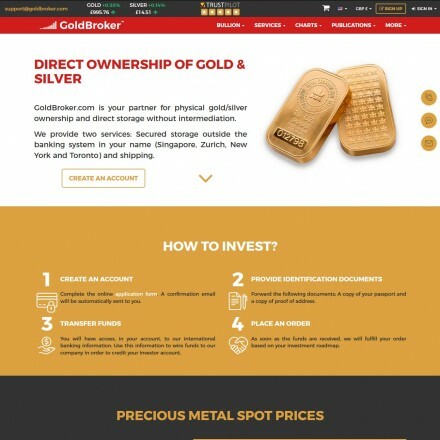 Physical bullion trading accounts make it possible to buy the same type of Good Delivery gold as the super-rich and institutional investors, in fractional amounts, at wholesale prices very close to spot – and all in the click of a mouse. Likewise selling can be achieved with a few mouse clicks and at sell prices slightly under spot, giving overall spreads in the region of 1.2-1.5% including dealer commissions – a significant saving and one which makes the trading of physical gold possible even on a small scale. Of course buying gold at such a discount over the traditional retail dealer route will be of benefit to long-term investors too. With a 1.5% spread versus a 15% spread, the investor can be 13.5% better off right from the start and will be in profit after a much smaller market gain. How do physical bullion trading accounts work? When you buy gold through a physical bullion trading account, either as part of a trading or investment strategy, you’re buying a fractional part of a large Good Delivery bar. Whether you invest in 1oz, 100g or 1kg – you are allocated the corresponding fraction of a much larger bar. The disadvantage is you don’t hold it in your hands – and for some gold-bugs this will be a deal breaker. However we’re talking trading – and in the same way as owning shares in a company doesn’t get you a hubcap, office desk or copy machine – you get a digital “certificate” stating you own a portion of an allocated bar. These digital certificates of all the gold and silver you buy are summarized within your online trading account which you can track on a real-time screen in much the same way as traders track stocks. 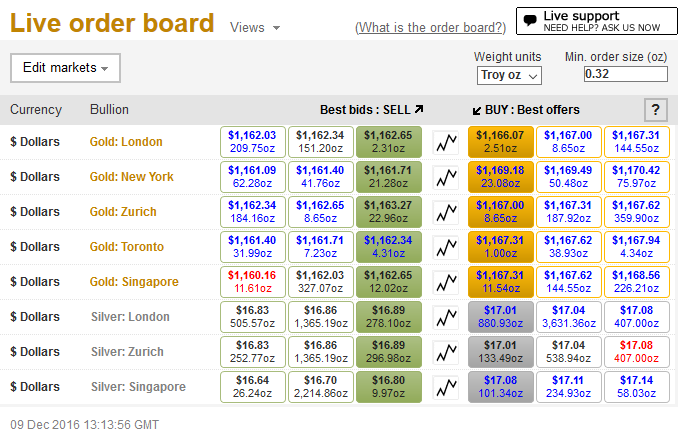 The image below shows a typical live order board where bars can be bought and sold at various secure locations around the world all from the comfort of the user’s home, with prices and weights being selected per individual preferences. Although this example is from Bullion Vault other order boards share similar properties and functions. You can buy more metals, sell fractions or sell everything through this simple interface in a few mouse clicks, timing your moves in the exact same way as traders time their moves in stocks, options and… ETFs. We list several Physical Gold Trading Account providers within Bullion.Directory and each offers physical traders broadly similar easy-to-use systems allowing for the same kind of immediate buy-sell control traders enjoy in the paper markets. 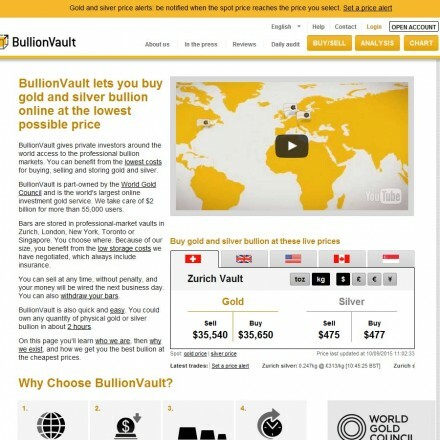 We’ve chosen to illustrate market leaders Bullion Vault due to their popularity, simple interface and backing by The Gold Council – however there are other physical trading companies we list and recommend including the excellent Goldcore, a company based in Ireland but with offices in London, GoldBroker.com the leading bullion broker based in Malta and New York, National Bullion House, Dubai’s bullion trading giant, and Bullion Capital the company offering physical trading accounts globally through a number of white-labeled providers from their base in Australia. Whilst most of the physical bullion dealers we list buy and sell precious metals using dollars, pounds and euros, one notable alternative is the UK-based company Vaultoro, who exchange crypto-currency Bitcoin for metals. This allows for near instantaneous transfer from Bitcoin to gold and back again as the markets move. One particular advantage of this is that gold and Bitcoin are typically priced in US dollars yet the two both move very differently in relation to dollars, so funds can be transferred back and forth between the two mediums taking advantage of market movements. A concern of many is that owning a share in a large Good Delivery bullion bar seems like any another paper derivative. You don’t typically take possession of the gold – so can you be sure it’s physically real? That somewhere in a vault there’s a chunk of actual gold with your name on it? But then you could have the same doubts when you buy gold to add to your IRA, SIPP or any other state-approved retirement plan. 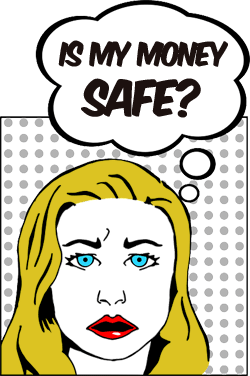 After all when you’re buying precious metals for your gold IRA you don’t get to see that gold, and you certainly can’t take delivery without triggering a tax penalty – but you rest easily knowing the gold exists thanks to a tightly monitored paper trail and chain of custody ensuring the safety, security and ownership of your retirement gold. Well that’s small-fry in comparison to the safeguards and layer upon layer of verification, certification and multiple audits conducted on the metals held by companies running physical gold trading accounts. As an example BullionVault now holds over 11% of the UK’s gold reserves in it’s vaults, with daily audits at multiple ultra-high security locations. 60,000 clients over 75 countries own $2 Billion and trade $100 million in gold and silver every single month. At this level of uptake and with the backing (and part-ownership) of the World Gold Council – you can be assured that all of the gold and silver held by the program is very real. Physical trading now shares the ease of buying and selling of it’s paper rivals, but what is it that makes physical better than ETFs or equivalent paper gold derivatives? For us the number one failing of an ETF as an investment or gold trading vehicle is simple – you never own nor have claim to any physical gold. As already mentioned this is a real concern to gold bugs and conspiracy theorists – especially when several gold ETF providers readily admit their ETFs are not backed by any gold whatsoever – and this fact can be checked in their publicly available trust deeds. Surely if you buy and sell gold you really want to buy and sell the metal itself – not a convoluted and complex financial model based off some theoretical metals and backed by nothing other than a promise. This is because physical gold is unlikely to ever go to a zero value. The same cannot be said for paper gold backed by little more than a banker’s word! The second massive advantage of trading physical bullion through a bullion account is that of time. ETFs are traded on the major stock exchanges, and these tend to be open 8 hrs a day, 5 days a week. Settlement to your stockbroker takes two to three days, who then in turn settles with you. On the other hand physical bullion trading accounts are open for dealing 24/7 with instantaneous settlement to your account – and with withdrawal to your bank account taking a single business day. With a physical bullion trading account you can buy the most secure and most tradable form of gold and silver, held at your choice of high security vault and at the wholesale prices only industrial scale investors previously had access to. Buying, selling and settlement are instantaneous – and spreads including buy/sell commission are typically 1.2%. To summarize, for anyone trading physical bullion, or looking for a hands-off low-cost ownership and storage route to metals investment there really is nothing that comes close for speed of transaction, cost value or investment security. 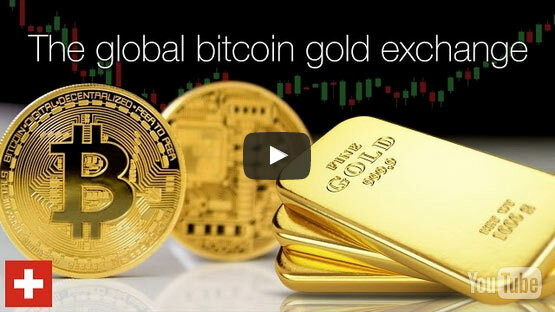 Want to look further into trading physical gold with a gold trading account? 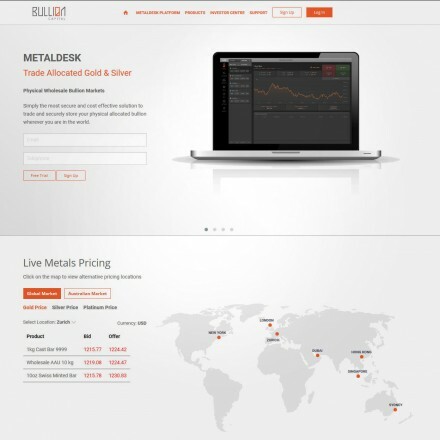 These are the four principal bullion trading platforms we list. Accounts are free to open and carry no obligation, so it’s easy to find one that’s the best fit. Trading physical metals is about making a gain through a positive difference between purchase price and selling price. Trading metals-backed derivatives is about making gains through taking positions based on predicted price movements. With physical bullion – you only ever make money in a single market direction – upwards. Derivatives on the other hand can be used to make money on rising, falling, flat and turbulent markets. In short, paper gold traders can win when the markets go down just as much as when they go up. You don’t have to like paper gold, but it can be hard to argue against two-way profits. But of course this is a simplistic look at paper trading’s key advantage. The reality of gold derivative trading is incredibly complex, especially if you factor in leverage, the double-edged sword allowing for greater profits but also for losses that can be far in excess of the trader’s stake. And it’s this potential for huge losses that brings us back to the security of trading physical bullion. Paper markets are simply legal gambling and without proper training have seen many a trader lose everything in a single market movement. Physical bullion on the other hand is and always will be a store of value. So How Can You Trade Physical Bullion Without Being So Reliant On Gold Prices Rising? Again, technology has provided a solution – this time through use of The Blockchain. 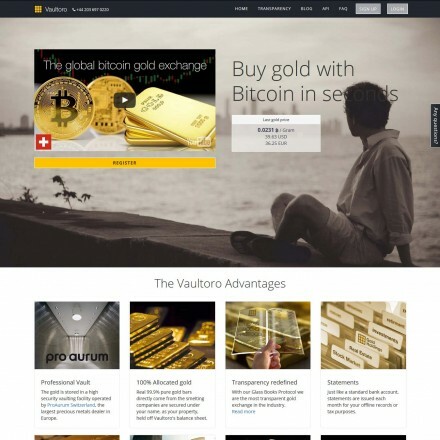 With the launch of Vaultoro’s physical gold trading exchange, investors and traders can buy and sell bullion online using Bitcoin as payment. 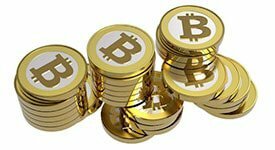 Accounts can be transferred over to gold, then back to bitcoin instantly. By timing moves as a trader would, it’s possible to move from gold to bitcoin as gold peaks, back to gold as bitcoin drops, moving all, or some of the account back and forth, taking advantage of volatility. Even when gold is trading flat, or dropping – an account can be benefiting from bitcoin’s rise. Yes both investments are highly volatile in the short term – making them a day-trader’s dream investments and can be used within Vaultoro to carry out fast reactive and proactive trades in the truest sense of the word. Yet for the longer term investor or passive investor, both generally rise over time, and both see use as a safe harbor during times of crisis. With an account 50% in gold and 50% in Bitcoin, or some other ratio in keeping with the investor’s strategy – the overall account should benefit from both short-term and long-term gains equally.